Allen Kessler the structures for WSOP are so good he can't see any player leaving the Rio. What poker player doesn't love starting out with more chips? In celebration of their 50th anniversary, the World Series of Poker has announced a robust schedule for the 2019 edition, complete with several additions including more lower buy-in tournaments, nine total online events and even a Short Deck Championship. Another major theme for 2019 is more value and with that — more chips. On Wednesday, the WSOP released structures for all 89 events on the 2019 schedule, and as promised, the increased value is apparent throughout. "We are confident players will find the structures the best value they have ever seen at the WSOP," WSOP VP of Corporate Communications Seth Palansky told PokerNews. While the structure overhaul began with increasing starting stacks and instituting the big blind ante (BBA) in applicable events, the WSOP didn't stop there. "Jack Effel and his team wanted to make sure that these weren’t smoke and mirror changes like a lot of places do," Palansky said. "Jack made sure that all the changes resulted in deeper play at all stages of the tournament. This gives everyone more comfort in Day 1 of the tournament as well as room to play as the tournament progresses at key later stages." 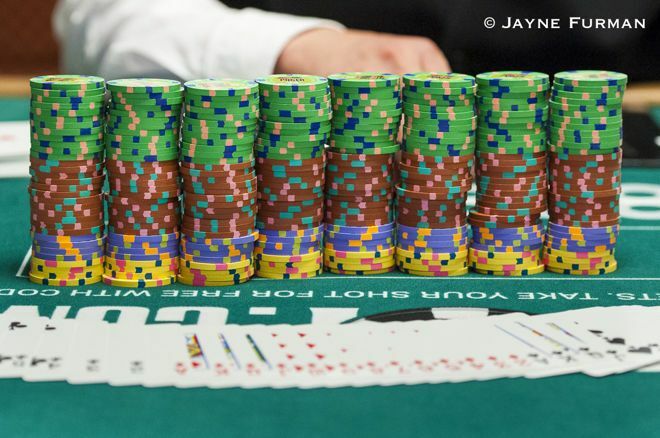 More chips doesn't always equate to more value — a fact of which WSOP officials are well aware. Palansky: "We are confident players will find the structures the best value they have ever seen at the WSOP." We reached out to one of the most vocal tournament structure critics in the industry for his thoughts on the changes for 2019. Allen "Chainsaw" Kessler called the structures "excellent" overall, applauding them for "more chips and more play throughout." Another major difference from previous years is the increase in number of smaller no-limit events, making the WSOP more accessible to lower-limit and recreational players. While lower-end events on tournament schedules are often accompanied by fast structures, Kessler pointed out that is not the case here. "The smaller no-limits are way more competitive this year with deeper starting stacks and more play throughout." In addition to appealing to recreational players and those working with smaller poker bankrolls, these smaller events should also attract plenty of pros who appreciate the value for the price point. Below is a look at the starting stacks for each price point, as compared to what players sat down with last year. While the majority of the events on the 2019 schedule have been tweaked for deeper play per popular request, not everyone has the time to devote to poker tournaments that last four-plus days. WSOP has taken this into consideration, adding more fast-structured events to accommodate the segment of the population looking for a quicker bracelet-hunting fix. "The Super Turbo Bounty events were real popular and we do have a segment of players who have shorter time to play poker, thus those folks will find several offerings that allow them to compete for a bracelet," Palansky explained. "The whole Deepstack bracelet series is another example of this too. These still offer tremendous value — better than anything else in the marketplace — but with the pace to complete in 2/3 days." Kessler: "To be honest, I cant see any mixed or no-limit player leaving the Rio this year." The Deepstacks he mentions include six live events coming with a $600 or $800 buy-in price tag and start players out with 30,000 and 40,000 in chips, respectively. These events offer plenty of play within two-day or three-day structures, and Day 2 blinds are longer than Day 1 blinds to make for more play deeper in the event. While the two-day Deepstacks offer 30-minute blinds on Day 1 followed by 40-minutes levels on Day 2, the three-day Deepstacks have 40-minute Day 1 levels and 60-minute levels on Days 2 and 3. All of the Deepstacks are single reentry. A prime example is Event #59: $600 No-Limit Hold'em Championship kicking off on Tuesday, June 25. Players sit down with 300-big blind stacks (30,000 chips at blinds of 100/100) and play to blinds of 40 minutes on Day 1, followed by 60 minutes. This Deepstack also comes with a $500,000 guarantee and has a Main Event seat added for the winner. "Like everything at the WSOP, we offer something for everyone and we are sure there are several events that everyone can find and enjoy and get a great experience competing in. There is no doubt that anyone who comes to Las Vegas this summer will find the best value for their buck and the biggest prize pools up for grabs at the 50th Annual World Series of Poker at the Rio." Some value-hunters like Kessler may not find a reason to leave the grounds, after previously popping into different tournaments at various venues, wherever there was value to be found. "To be honest, I cant see any mixed or no-limit player leaving the Rio this year," he said.